Oh New York… so many dining options, so little time. On this trip, we decided that we weren’t going to break the bank, so other than lunch at Jean Georges, that meant no 3 Michelin stars. But maybe I could find a good 1 star? I had heard some fantastic things about Marea, with its newly appointed 1 Michelin star but the earliest reservation I could get was at 9:45pm. I was worried that my stomach wouldn’t be able to hold out until then, so at the last moment I booked a 8:15 reservation at A Voce Columbus. The great thing was that both restaurants were within a few blocks of our hotel. We decided that we’d tell our server at A Voce in advance that we had somewhere else to go and we were only going to eat a few dishes. What we didn’t count on was that so many things on the menu would call to us. I was disappointed when I found out their signature pork belly was sold out for the evening, but everything else was so delicious it somewhat made up for that. 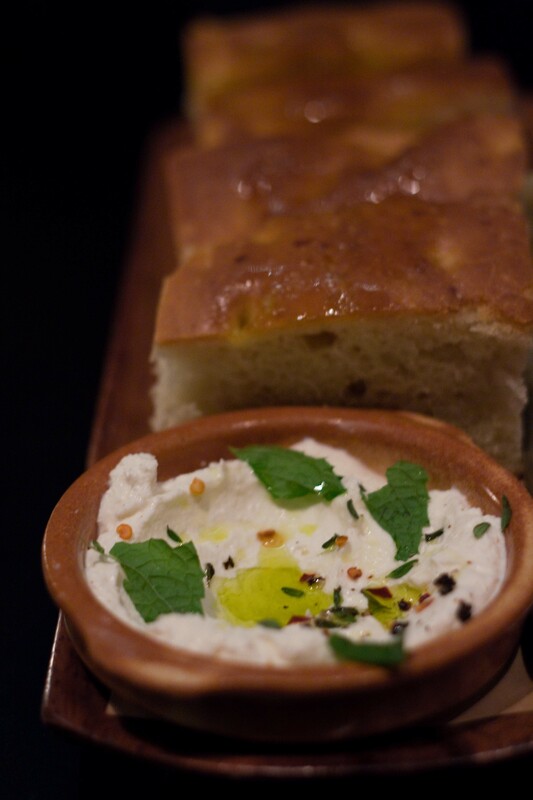 Homemade focaccia with the best ricotta Ive ever tasted. I ate 3/4 of the dish on 1 slice of focaccia! Knowing that we had another restaurant ahead, I knew we had over-ordered and it’s probably the first time anyone’s ever hoped the portion sizes were going to be small. I was somewhat hopeful when the first plate arrived. 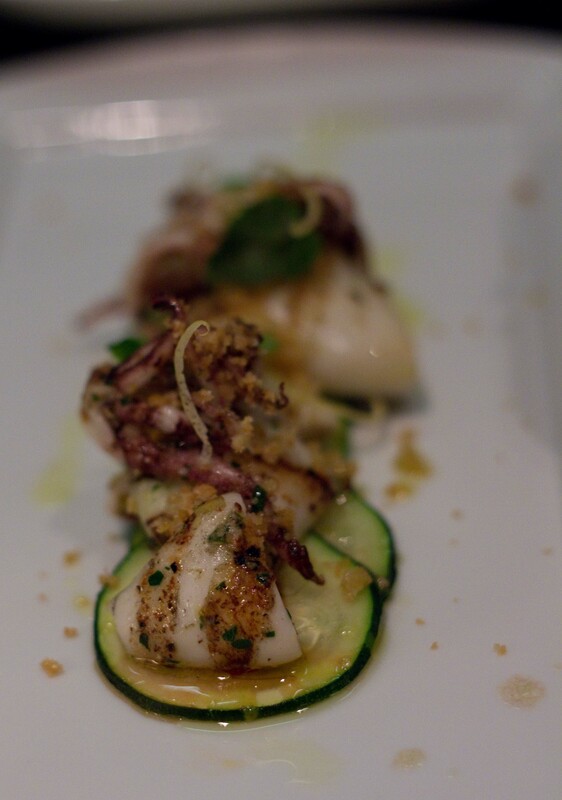 Grilled calamari with zucchini, mint, preserved lemon and a hint of chili. I knew we were doomed when the next 2 were placed on the table. It didn’t help we chose items with so much cheese, but they were delicious and I wouldn’t have had it any other way! 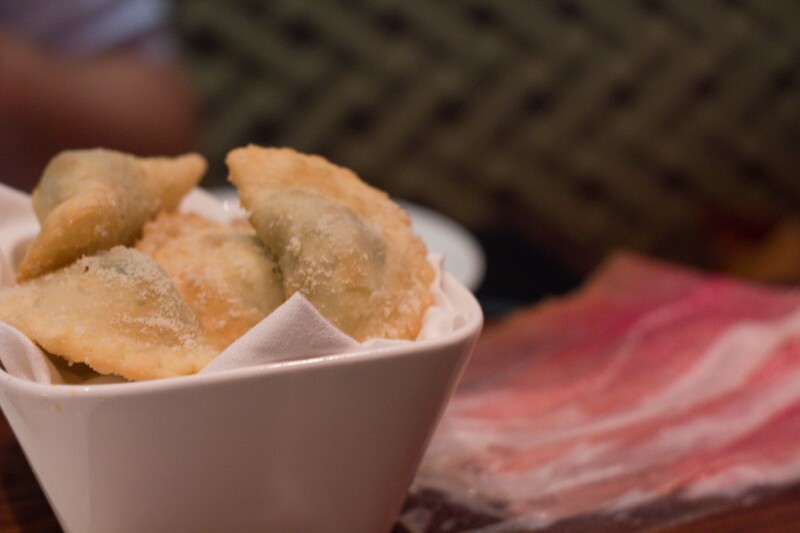 Cassoncini con Prosciutto di Parma –Slices of prosciutto on the side added a nice bit of saltiness to the creamy cheese and swiss chard filled fried dough. 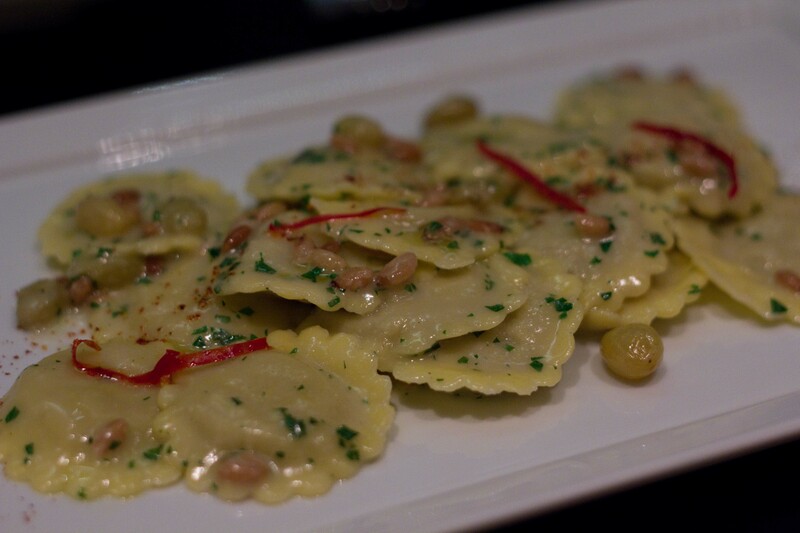 Delightfully light pillows of goat cheese filled ravioli with pine nuts, raisins and chilis in a beautiful butter sauce. Already full from meal #1, we made our way across Columbus Circle to Marea. When we walked in, I was taken by the fact the room was completely opposite from the loud and crowded A Voce. Although the restaurant was busy, the space allowed for a much more intimate dining experience. The other thing that I was amazed with was that the service was much more attentive here. 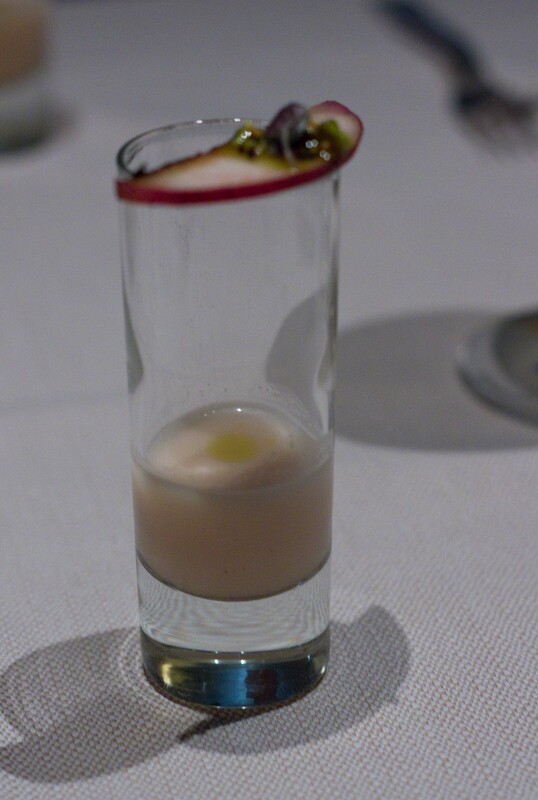 An amuse bouche was quickly delivered to our table. I wasnt paying attention when we got this. All I heard was pickled plum with pistachio. What the cold soup was, I couldnt tell you, not even after I tasted it. And I have a great palate for picking out flavours! Seeing as we were pretty much full from our first meal, we stuck to the small plate side of the menu. My sole reason for choosing this restaurant was to taste this plate. 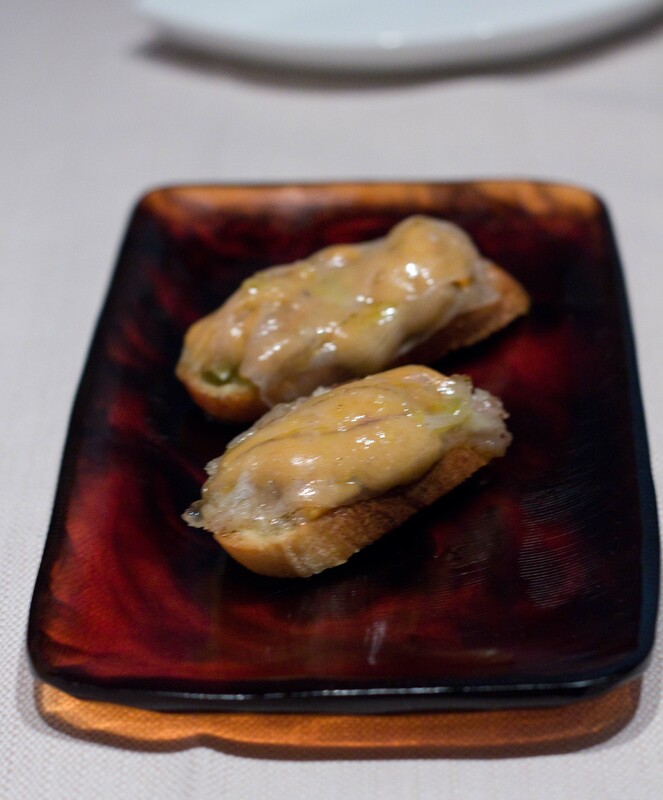 Uni with a thin slice of lardo on top of a crostini. Sea urchin by itself is pretty amazing, so it doesnt necessarily need to be gussied up, but a thin layer of salty fat is always a welcome addition to anything I eat. 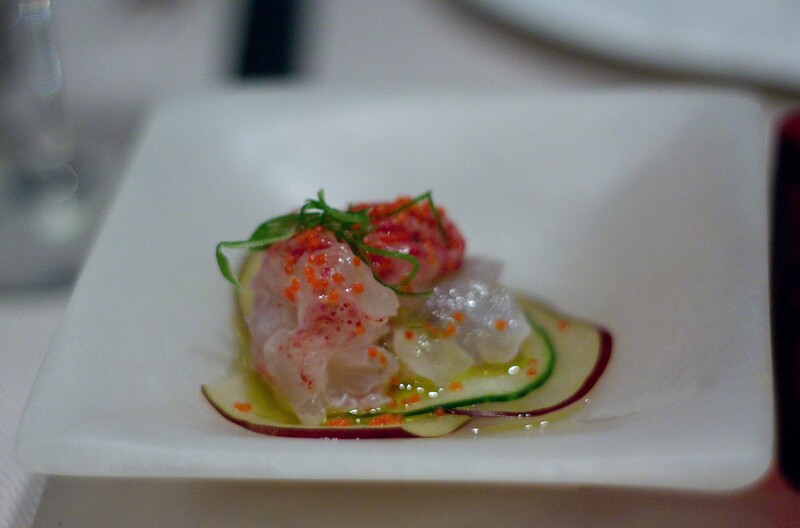 Since they are known for their crudos we ordered their trio so we could get small tastes of more things. Lobster with cucumber and plum. Raw lobster tastes like raw shrimp, only bigger. We asked for the server’s suggestions and he led us to choose items that weren’t the “regular” tuna or salmon. 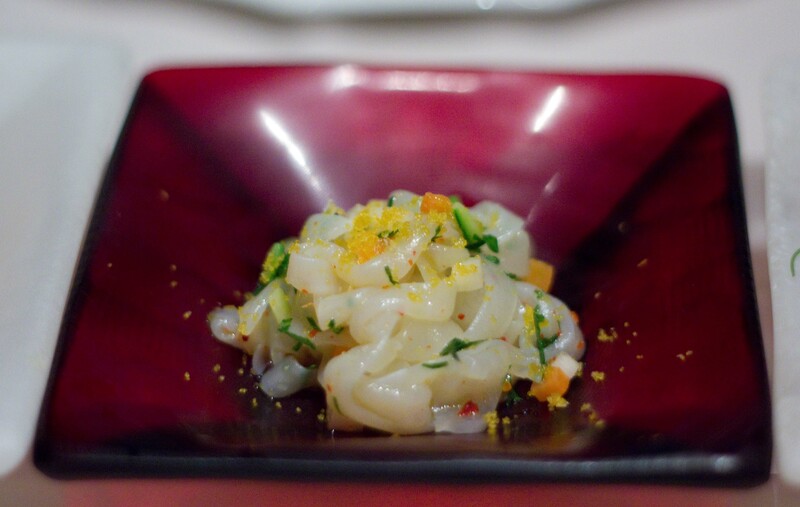 Cuttlefish tagliatelle, soffrito crudo and bottarga di muggine – my favorite of the three. 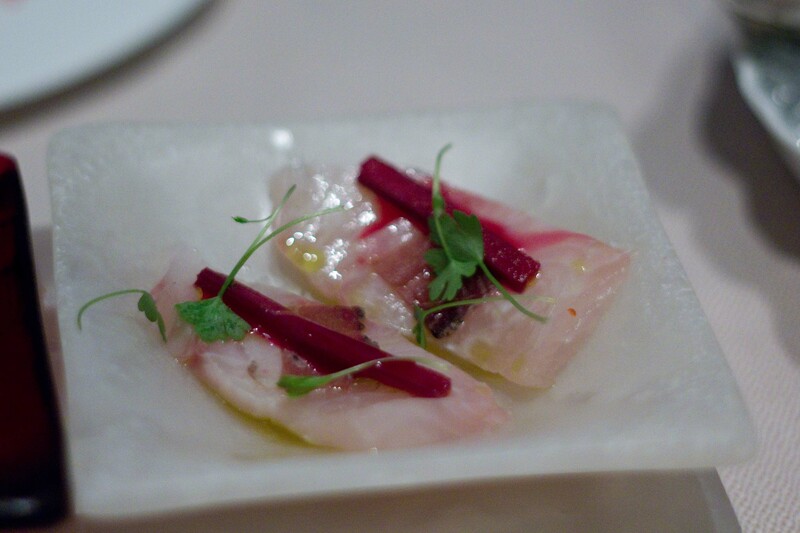 Mackerel is known to be a “fishier” fish, but this Pacific Jack mackerel with duck prosciutto and rhubarb had all the fattiness of mackerel with none of that fishy flavour. Ben’s not usually an oyster guy, so although I had no thoughts of ordering raw oysters, when he suggested it I didn’t want to say no. The Glidden Point from New York were small and briny while the Dennis from Massachusetts were a bit bigger and sweeter. 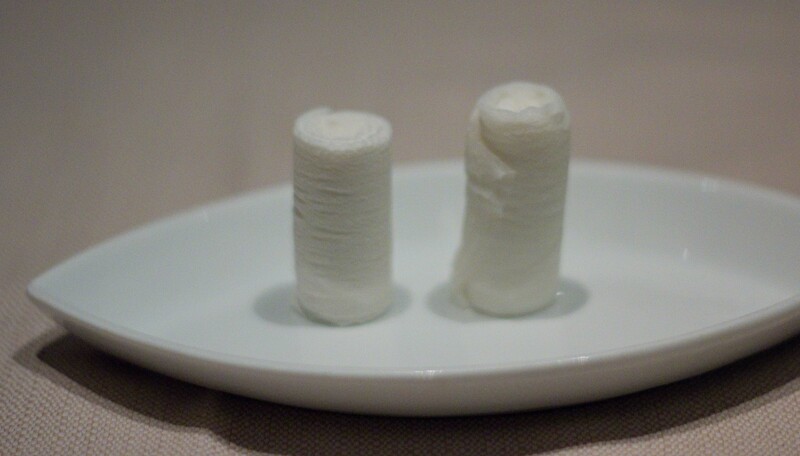 We were then served what looked like 2 Altoids. I was thinking that it was too early for our after dinner mint, because we had 1 more dish to come. Then the food runner came and poured some boiling water of the top of them and we watched them expand. Marshmallows? Ear plugs? Nope! Warm hand wet hand towels! I like it when theres a bit of unexpected theatrics in my meal. 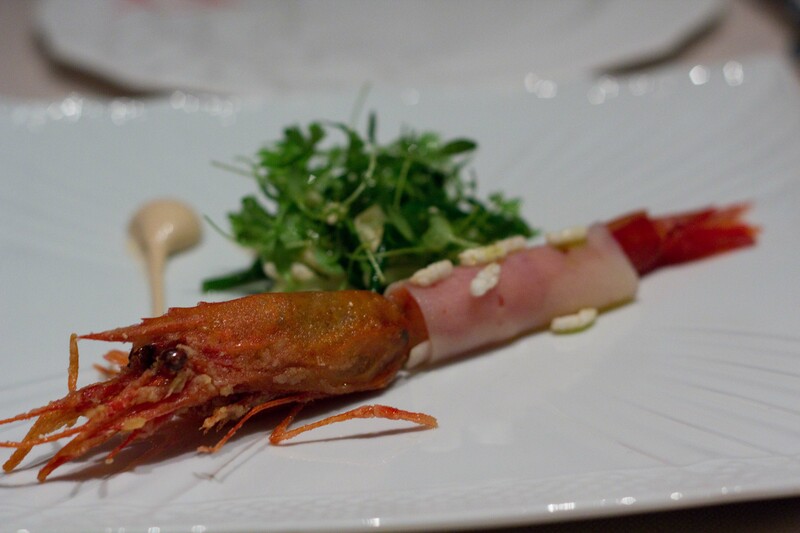 Scallop wrapped red prawn with sea beans and puffed rice. The ribbon of scallop around the prawn was good, but my favorite part was eating the crispy salty head. Completely full by this point, we had no room for dessert. But there’s always room for chocolates. 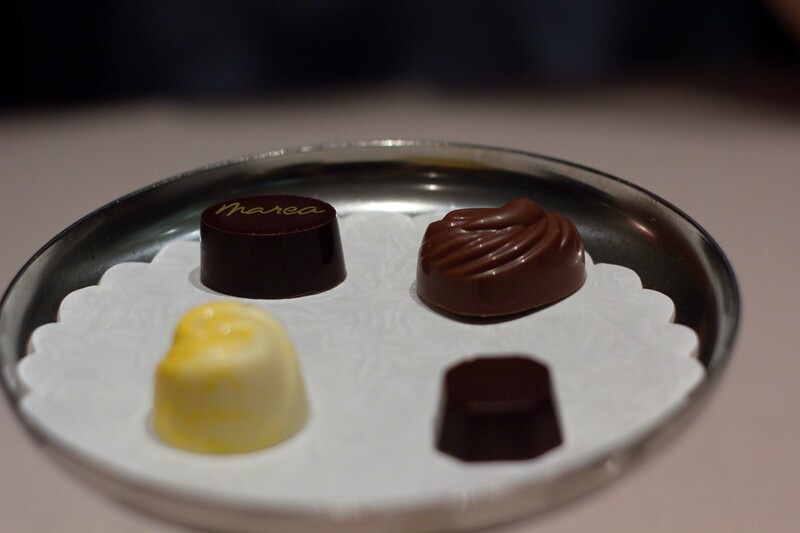 Just like when the amuse bouches are delivered, I never really listen to the description of the chocolates. Doesnt matter anyways, theyre were eaten quickly. We ended our fantastic evening out with a nightcap at Dizzy’s Cola Bar, which also happens to be right next to our hotel. Although I’m not one to recommend “must do’s” on anyone’s trips, I would say checking out an after-hours set here is one. They’re having a summer special right now too, so for $5 cover you get to sit in one of the best sounding rooms I’ve ever been in overlooking Central Park. 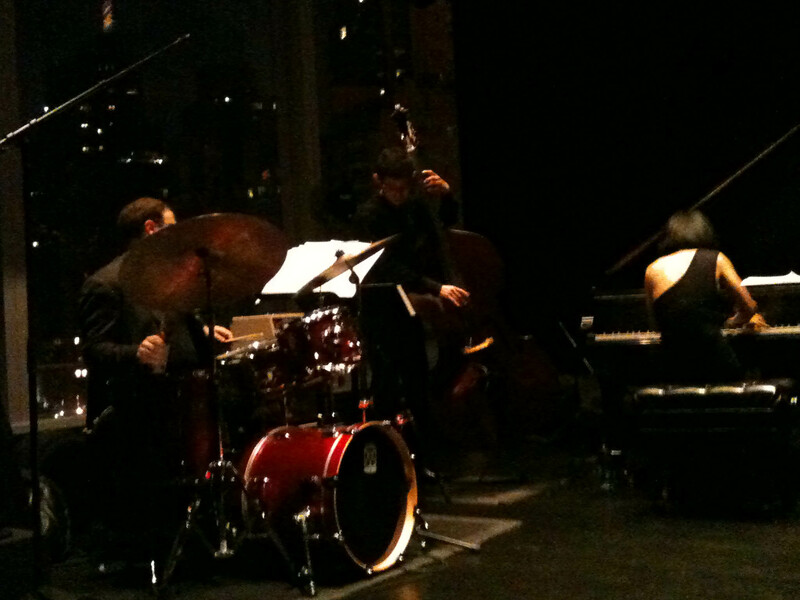 A great way to end the evening with Chihiro Yamanaka on the piano. I love your attempt at two light late dinners that turn into approximately 12 dishes! 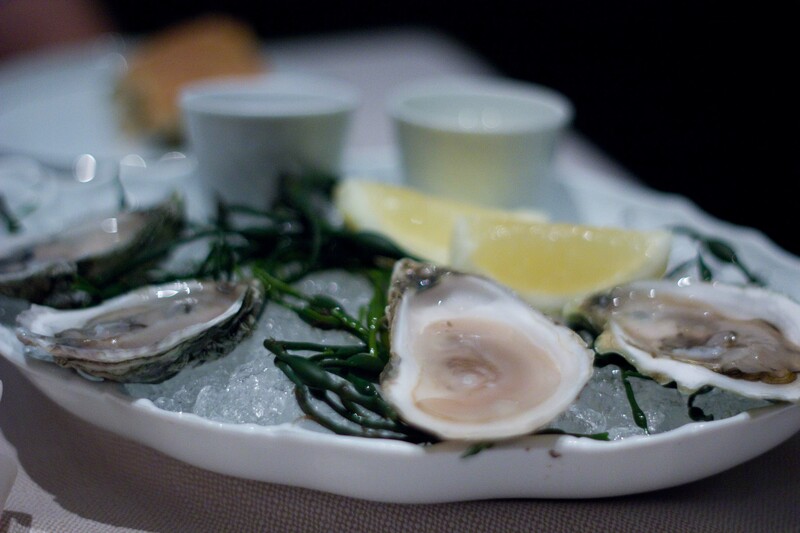 Everything looked great, especially the ricotta cheese, uni and those goat cheese ravioli, oh and the oysters as well! But the dishes at Marea were so small! Everything was good, which is why we kept eating well past when we were full. I’m happy with the photos as well, thanks though! Previous PostPrevious Zakkushi = Skewers of meats = Deliciousness!